The Windemere Hotel & Conference Center provides a compelling alternative to larger, convention-oriented hotels serving the Mesa / Phoenix / Scottsdale meetings market. Our intimate style boardrooms, meeting rooms and outdoor function areas provides a great convention setting. In all, over 8,500 square feet of newly remolded interior meeting space and 15,000 square feet of beautifully laid out patios and lawn and garden locales. 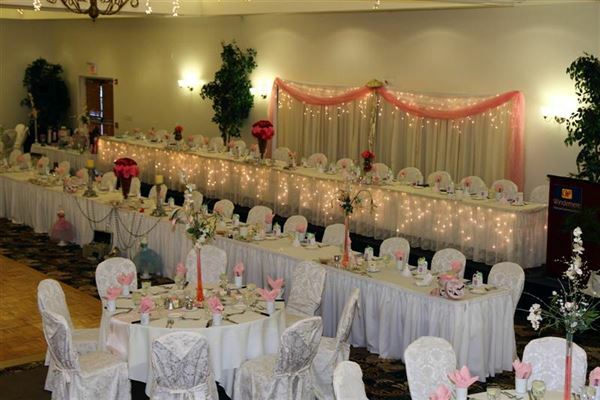 Our spacious ballrooms can easily accommodate 50 - 250 guests each and we offer special room rates for your guests. For weddings, we offer both indoor and outdoor spaces for weddings and commitment ceremonies that are affordable, picturesque and elegant. Whether it's our mature landscaped garden courtyard or one of our spacious newly renovated ballrooms, you'll agree that our wedding and reception space at the Mesa Windemere Hotel & Conference Center offers a pleasant setting. Complete Lunch Packages • Crystal | $34.95 per person • Bronze | $37.95 per person • Silver | $40.95 per person • Gold | $43.95 per person • Platinum | $46.95 per person • Diamond | $50.95 per person Plated Lunch Entrees • Mediterranean Chicken Pasta • Roast Prime Rib of Beef • Chicken Scampi • Grilled Atlantic Salmon • Roast Pork Tenderloin • Chicken Marsala or Baked Lemon Chicken • Beef Tenderloin • Vegetarian or Meat Lasagna or Homemade Meat Loaf Lunch Buffets • The Courtyard Deli • South of the Courtyard • Southwest Barbecue • Touch of Italy Complete Dinner Packages • Crystal| $40.95 per person • Bronze | $44.95 per person • Silver | $47.95 per person • Gold | $51.95 per person • Platinum | $54.95 per person • Diamond | $58.95 per person Plated Dinner Entrees • Roast Prime Rib of Beef Au Jus • Filet Mignon • Filet Mignon and Shrimp Scampi • Grilled King Salmon • Shrimp & Lobster • Chicken Marsala or Beef Tips • Sonoran Chicken or Chicken Cordon Bleu • Vegetable or Meat Lasagna There is no charge for the tables, chairs, podium and microphone if needed. You will only be charged for the food and beverage that you select for your event and a minimal room rental for 680 square feet of the boardroom @ $175.00++, 1,200 square feet of the ballroom @ $325.00++, for 2,400 square feet of the ballroom @ $650.00++ or for 3,600 square feet of the ballroom @ $975.00++. Please see attached PDF for additional information and menu options. Complete Lunch Packages Crystal | $34.95 per person - Complimentary fruit punch in decorative fountain during social hour and throughout entire reception, complimentary assorted sodas all day, 1 cold hors d’oeuvre tray and a selection of 1 hot hors d’oeuvre passed butler style unlimited during the social hour, lunch buffet with 2 entrées, carver if needed. Bronze | $37.95 per person - Fruit punch in decorative fountain during cocktail reception, 2 cold hors d’oeuvre trays and a selection of 1 hot hors d’oeuvre passed butler style unlimited during social hour, host 2 drink tickets per person to include: bottled import and domestic beer, wine, and sodas, cash bar for cocktails lunch buffet with 2 entrées, carver if needed. Silver | $40.95 per person - Fruit punch in decorative fountain during cocktail reception, 2 cold hors d’oeuvre trays and a selection of 2 hot hors d’oeuvre passed butler style unlimited during the social hour, host 2 drink tickets per person to include: call brands, bottled import and domestic beer, wine, and soda, lunch buffet with 2 entrées, carver if needed. Gold | $43.95 per person - Fruit punch in decorative fountain during cocktail reception, 2 cold hors d’oeuvre trays and a selection of 2 hot hors d’oeuvre passed butler style unlimited during the social hour, host 2 drink tickets per person to include: call brands, bottled import and domestic beer, wine, and sodas, lunch buffet with 3 entrées, carver if needed. Platinum | $46.95 per person - Fruit punch in decorative fountain during cocktail reception, 2 cold hors d’oeuvre trays and a selection of 2 hot hors d’oeuvre passed butler style unlimited during the social hour, host 4 drink tickets per person to include: call brands, bottled import and domestic beer, wine, and sodas, lunch buffet with 3 entrées, carver if needed. Diamond | $50.95 per person - Fruit punch in decorative fountain during cocktail reception, 2 cold hors d’oeuvre trays and a selection of 2 hot hors d’oeuvre passed butler style unlimited during the social hour, host 4 drink tickets per person to include: call brands, bottled import and domestic beer, wine, and sodas, dinner buffet with 3 entrées, carver if needed, and a tray of chocolate dipped strawberries placed on tables as cake is served. Complete Dinner Packages Crystal | $42.95 per person - Complimentary fruit punch in decorative fountain during social hour and throughout the entire evening of reception, complimentary assorted sodas all evening, 1 cold hors d’oeuvre tray and a selection of 1 hot hors d’oeuvre passed butler style unlimited during the social hour, dinner buffet with 2 entrées, carver if needed. Bronze | $46.95 per person. -Fruit punch in decorative fountain during cocktail reception, 2 cold hors d’oeuvre trays and a selection of 1 hot hors d’oeuvre passed butler style unlimited during the social hour, host 2 drink tickets per person to include: bottled import and domestic beer, wine, and sodas, cash bar for cocktails, dinner buffet with 2 entrées, carver if needed. Silver | $49.95 per person -Fruit punch in decorative fountain during cocktail reception, 2 cold hors d’oeuvre trays and a selection of 2 hot hors d’oeuvre passed butler style unlimited during the social hour, host 2 drink tickets per person to include: call brands, bottled import and domestic beer, wine, and sodas, dinner buffet with 2 entrées, carver if needed. There is no charge for the tables, chairs, podium and microphone if needed. You will only be charged for the food and beverage that you select for your event and a minimal room rental for 680 square feet of the boardroom @ $175.00++, 1,200 square feet of the ballroom @ $325.00++, for 2,400 square feet of the ballroom @ $650.00++ or for 3,600 square feet of the ballroom @ $975.00++. Please see attachment for additional menu options. All Wedding Receptions Packages of 100 people or more Include: • Complimentary room for the Guest of Honor The night of the Reception • Complimentary Champagne & Cider Toast • Complimentary Cake Cutting and Service • 2 Gallons of Complimentary Punch with Rental of Punch Fountain ($50.00) Note: Punch Fountain is included in Complete Packages • Colored Linens, China and Silverware, Glassware • Four different Centerpieces for you to choose from • Lunch/Brunch Receptions: Brunch Buffet | $29.95 per person Complete Lunch Packages: Crystal | $34.95 Bronze | $37.95 Silver | $40.95 Gold | $43.95 Platinum | $46.95 Diamond | $50.95 Complete Dinner Packages: Crystal Package | $42.95 per person - Complimentary fruit punch in decorative fountain during social hour and throughout the entire evening of reception, complimentary assorted sodas all evening, 1 cold hors d’oeuvre tray and a selection of 1 hot hors d’oeuvre passed butler style unlimited during the social hour, dinner buffet with 2 entrées, carver if needed. Bronze Package | $46.95 per person - Fruit punch in decorative fountain during cocktail reception, 2 cold hors d’oeuvre trays and a selection of 1 hot hors d’oeuvre passed butler style unlimited during the social hour, host 2 drink tickets per person to include: bottled import and domestic beer, wine, and sodas, cash bar for cocktails, dinner buffet with 2 entrées, carver if needed. Silver Package | $49.95 per person -Fruit punch in decorative fountain during cocktail reception, 2 cold hors d’oeuvre trays and a selection of 2 hot hors d’oeuvre passed butler style unlimited during the social hour, host 2 drink tickets per person to include: call brands, bottled import and domestic beer, wine, and sodas, dinner buffet with 2 entrées, carver if needed. Gold Package | $53.95 per person - Fruit punch in decorative fountain during cocktail reception, 2 cold hors d’oeuvre trays and a selection of 2 hot hors d’oeuvre passed butler style unlimited during the social hour, host 2 drink tickets per person to include: call brands, bottled import and domestic beer, wine, and sodas, lunch buffet with 3 entrées, carver if needed. Platinum Package | $56.95 per person - Fruit punch in decorative fountain during cocktail reception, 2 cold hors d’oeuvre trays and a selection of 2 hot hors d’oeuvre passed butler style unlimited during the social hour, host 4 drink tickets per person to include: call brands, bottled import and domestic beer, wine, and sodas, lunch buffet with 3 entrées, carver if needed. Diamond Package | $59.95 per person - Fruit punch in decorative fountain during cocktail reception, 2 cold hors d’oeuvre trays and a selection of 2 hot hors d’oeuvre passed butler style unlimited during the social hour, host full bar for 3 hours, dinner buffet with 3 entrees, carver if needed and a tray of chocolate dipped strawberries placed on tables as cake is served @ $ 59.95++per person There is no charge for the tables, chairs, podium and microphone if needed. You will only be charged for the food and beverage that you select for your event 1,200 square feet of the ballroom @ $325.00++, for 2,400 square feet of the ballroom @ $650.00++ or for 3,600 square feet of the ballroom @ $975.00++. Please see attached PDF for additional information and menu options. The Windermere’s beautifully appointed, yet practical Conference Center with 114 guestrooms is perfect for business meetings and conferences of all sizes and styles. A little work and a little play are keys to successful meetings at the Windemere Hotel & Conference Center. Whether you are meeting for the day or extending it overnight, our “More Than a Meeting” takes care of every need. Package Includes: • Deluxe Continental Breakfast • Private Luncheon • AM / PM Refreshment Break • Podium and microphone, riser staging, 8 foot by 8 foot tripod projector Screen • Flip chart w/Pad & Markers • Wireless High Speed Internet There is no charge for the tables, chairs, podium and microphone if needed. You will only be charged for the food and beverage that you select for your event and a minimal room rental for 680 square feet of the boardroom @ $175.00++, 1,200 square feet of the ballroom @ $325.00++, for 2,400 square feet of the ballroom @ $650.00++ or for 3,600 square feet of the ballroom @ $975.00++. Ideal place for a small meeting and luncheon. The service was good and everone liked the luncheon buffet. Would like to see their outdoor sign updated. Roger, Thank you for your kind works, we really appreciate your feedback. I have passed on your suggestion about updating our outdoor sign to our management. I am chairwoman of a large Women's group that meets monthly for lunch at the Windemere. Each month our ladies have been very pleased with the beautiful presentation of the room and the delicious food. I personally enjoy working with Donna and Marina (event coordinators) as they are helpful and professional. I had an event “Spring Formal” at the Windemere. The Event was extremely successful. It was talked about for days afterward. The Staff was wonderful! Food was magnificent. Cannot imagine how it could have been better. It was so easy to work with Donna and the whole catering group. I will always consider the Windemere for future events. Donna, Thank you so very much for all your kind words, we truly do try to make each event as "Amazing" as possible. As always it is our pleasure to work with you and your "Wonderful Group. We look forward to seeing you at your next event. Sincerely, Donna Heitkotter and the Windemere Staff! We had a large event at the Windemere with over 300+ persons invited. Donna and Marina arranges for the set up of the large ballroom and audio system. Everything was arranged beautifully. We appreciate their hard work to be a gracious host and to help make our event a success.